Most likely she is looking for her passport. Gee. I wonder why? 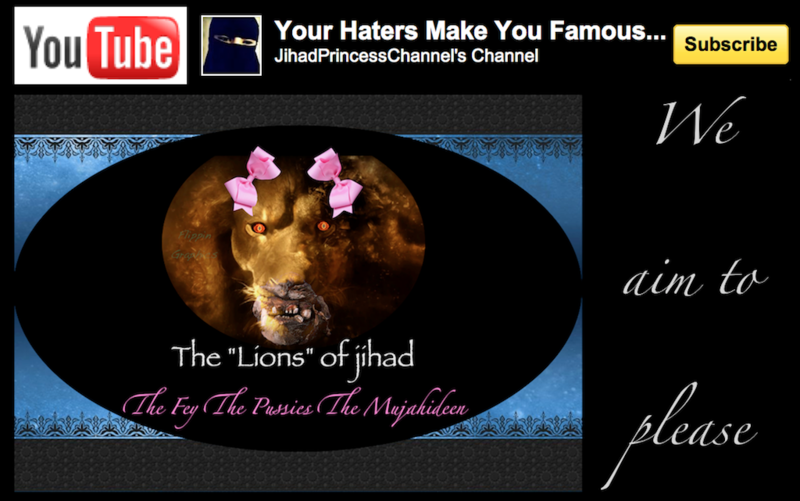 Note please, Jihad Princess is NOT to be confused with Jihad Jane. One is in prison, one is not. 05-10-11 another post – Dedicated To YouTube user JihadPrincess And The Religion Of Peace – Word For Word As She Defines It…. Oh! And did I say she didn’t like the Smackdown crew? It is kind of an understatement. She tried (unsuccessfully) to get this copycat site going. Just didn’t seem to catch on – http://www.youtube.com/user/SmackdownOfTheDay THANK YOU STARCMC – I forgot that one! This post is getting a little long winded – though we have LOTS more. Think I shall close with (for now) a piece of the Princess’ artwork – slightly (ahem) mutilated by OUR favorite artist we’ll just call “Flippin”. Damn I luv you man! 🙂 And Mrs. Flippin too for her forever patience! @JoeLieberman – We shall have a few words for you – soon. Hope you don’t mind. This entry was posted in Islamism and tagged Flippin, islamists, JihadPrincess, JoeLieberman, Jose Pimentel, Religion of Peace, youtube by LadyRavenSDC. Bookmark the permalink.